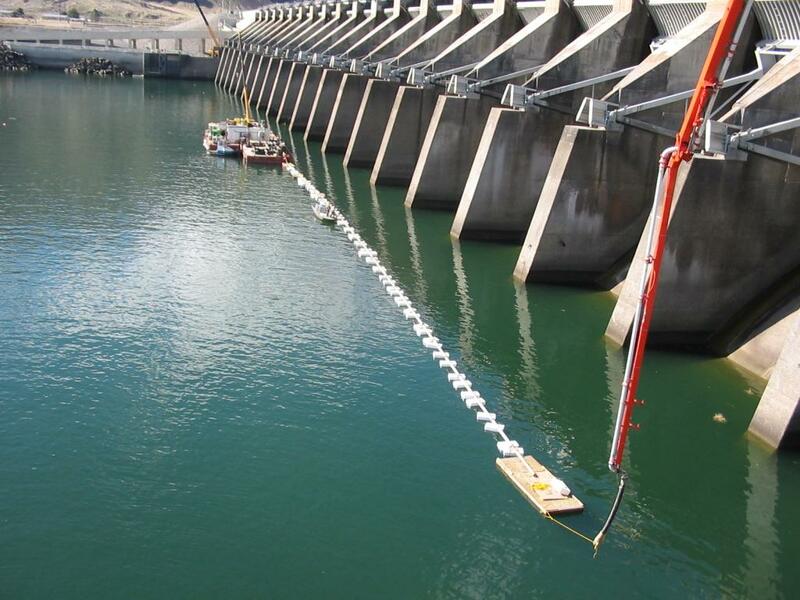 Priest Rapids Dam Spillway Apron and End Sill Underwater Concrete Repair - Global Diving & Salvage, Inc.
Unanticipated spill events caused severe erosion to portions of the ogee, stilling basin floor and the end sill at Priest Rapids Dam on the Columbia River. Global was hired as prime contractor by the Grant County Public Utilities Department to manage the project and make the repairs. The eroded concrete areas ranged from 3 inches to more than 3 feet, impacting areas of the ogee approximately 5 feet below the water line to the stilling basin floor; areas of the floor itself; the leading edge of the end sill; as well as areas along the top and vertical face of the end sill. In total, approximately 3,600 square feet of concrete was repaired. Repair areas were delineated by saw cutting and removal of existing material to a minimum of 6 inches of depth throughout the repair area. The areas were then pressure washed to remove algae and accumulation. Holes were drilled with rebar dowels set into epoxy, to which rebar mat was affixed. Holes up to 3 feet deep were drilled to anchor rebar along the bottom of the downstream edge of the sill wall. In all, more than 400 holes were drilled to anchor rebar dowels. Concrete removal was done with a combination of saw cutting (more than 2,000 linear feet cuts were made) and chipping with pneumatic chipping tools. Approximately 12 cubic yards of concrete was removed. Reusable forms were utilized throughout the project. The rear wall on the end sill was formed to 10 feet high and more than 50 feet in length. Custom-built fill and vent ports were fabricated and worked onto modular panels to facilitate underwater concrete pumping. Specific concrete formulations to allow for underwater installation were developed and tested. All tests yielded a higher performing product than specified. The locations of the pour areas required concrete to be pumped more than 650 feet, so a pump truck was positioned at the end of the power deck. 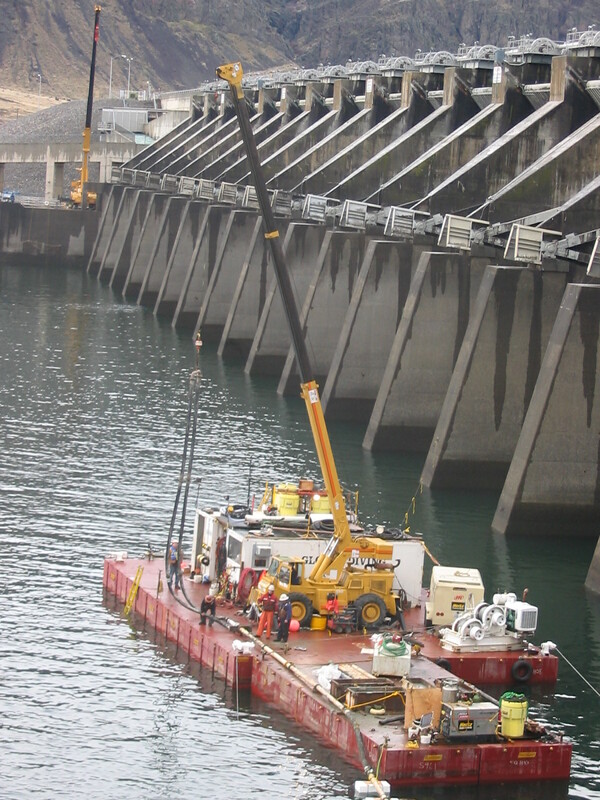 For the farthest pour, over 500 feet of pipe was supported on floats across the stilling basin. Over 300 cubic yards of concrete were placed without a single plug in the pump line.